Art is often about making a statement or telling a story, so it’s no surprise that art is often motivated by politics. But what happens when art and technology merge? A larger-than-life story is born. Global protest organization Greenpeace has been using massive video projectors and software to shine messages on nuclear power plants, across the bow of tankers, onto mountains in Switzerland, and everything in between to spread its message of hope for a healthier world. Greenpeace used its social media to help a projection-mapped protest go viral. No Somos Delito (We Are Not a Crime), which represents more than 100 organizations, including Greenpeace, worked with a production company called Garlic to create a stunning virtual protest against the “Gag Law.” A barely-visible scrim was hung in the street and wispy, ghost-like figures marched on for about 10 minutes at a time. The goal of these fleeting images, as with other “projection bombs” was to have the message spread virally through social media, get picked up by broadcast media, and have a long-tail effect living on the web. Is projection bombing legal? That’s a tricky question, which is why a projection mapper needs to be agile and knowledgeable. “The trick is to get set up quickly and get your photos as soon as you can,” said Jonathan Stevenson, media officer at U.K.-based Global Justice Now. Backbone Campaign projects its message on the U.S. Supreme Court. With a lean budget and people working in 20 cities throughout the U.S., Backbone Campaign needs to keep equipment setup simple. Each team is equipped with one or two ETC Source Four 750-watt ellipsoidal spotlights, and several gobos (goes before optics) with a chosen, pre-cut message. “We use a zoom, then we have two lenses that we can shift in order to create a wider or narrower beam depending upon what our target is,” said Moyer. “If the target is further away, we have a narrow beam to get there and not be too big and washed out.” For most projections, the team uses a Source Four with a zoom lens that goes from 15 to 30 degrees. Using two 12-volt-deep cell batteries wired in parallel gives them 15-to 20-minutes of projection time. Backbone Campaign has been using projection since Occupy Wall Street. 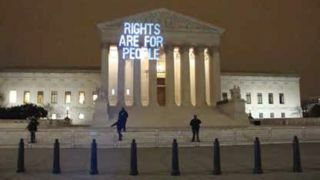 “On the second anniversary of that event, we projected ‘Rights Are for People’ up onto the face of the U.S. Supreme Court,” Moyer said.